First introduced in 1982 by the official mint of China, the design is different every year (except in 2001 and 2002). These designs mirror the design of the Silver Panda. The 1/4 oz Panda is one of a series of gold bullion coins minted by the People’s Republic of China, which were introduced in the early 1980’s, a boom time for global gold bullion production. The 1/4 oz Panda is one of the original weights, alongside the 1 oz, 1/2 oz and 1/10 oz variations, and still proves to be one of the most popular to this day. The 1/20 oz coin was added the following year and these options remain unchanged almost 40 years later. In 2016, however, these weights were converted to metric. The change mattered little to collectors, who primarily use the metric system as standard, but traders, who continue to use the Troy ounce system, have had some issues adjusting. The 1/4 oz Panda, up until 2016, had a total weight of 7.7758g before the switch over of 2016, but coins produced after the change weigh 8g. The dimensions of the coin have also been adjusted slightly, from a diameter of 21.95mm to 22mm. The thickness of the 1/4 oz Panda remains 1.53mm. The designs of the Chinese Panda are changed yearly, with the exception of the years 2001 and 2002, making it one of the most collectable set of gold bullion coins on the global market. Of the world’s most renowned bullion coins, only the Australian Nugget also changes its design yearly. 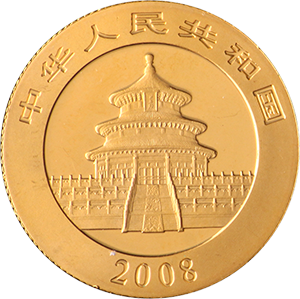 The coin’s obverse remains the same from the coin’s first design in 1982, the Temple of Heaven with the words “People’s Republic of China” written in Chinese underneath alongside the coin’s release date. On the coin’s obverse, the coin depicts the giant panda, who’s design is changed yearly. Such was the popularity of the yearly change that when the coin remained unchanged in 2002, the feedback was unequivocal in its condemnation.